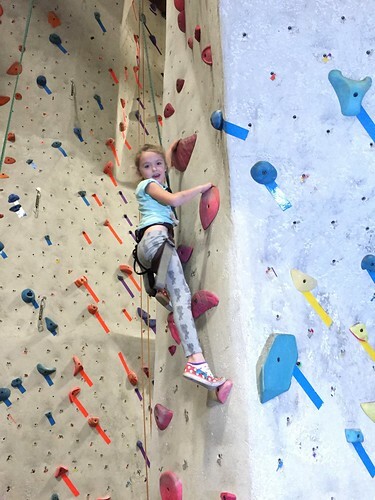 We hosted a Rock Climbing Birthday Party that was a whole lot of fun. I made the invitations by hand in this post. If you are in Northern California, we went to Studio Climbing. It’s in an old movie theater and makes really great use of the space. 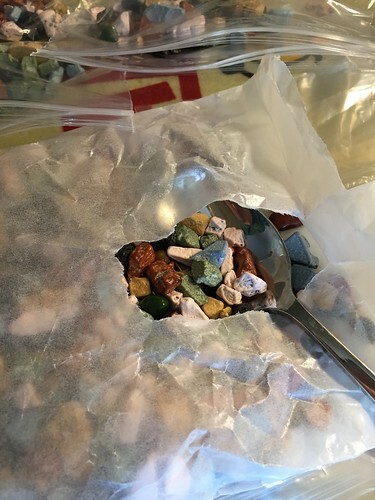 The candy rocks I found at a high-end chocolate store. We got about 1.5 lbs. 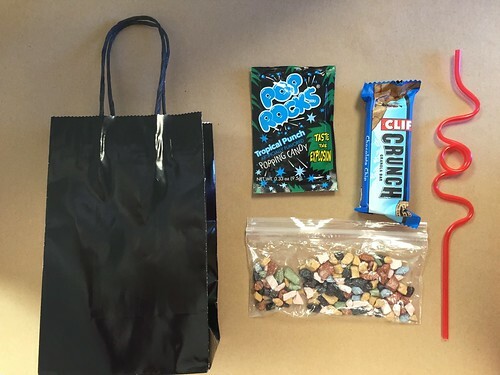 And then I put them into snack size zip lock bags. When we got the the climbing gym, they all had to fill out extensive waivers and get name tags at the front. From there they congregated in the party area. They were briefed on a few safety rules and then fitted with their harness. They require/offer 1 instructor for every 6 kids minimum. We lucked out and had a better ratio than that plus GREAT instructors. At one point, one of the younger siblings was climbing away and he got stuck (mentally, not physically.) He was in no danger, he was harnessed in and safe, but he was really unhappy. The instructors were right there, and when he was edging towards panic instead of calm, one instructor just jumped up the wall LITERALLY like Spider Man and took the boy in his arms and kind of carried him down. Calmly. It was something to see how fast and how easily he climbed the wall. And of course, the little guy was FINE and went on to climb the rest of the party. Here are two climbers, all the way up! Here is the happy birthday climber. This party had lots of things going for it. First, it did not feel like a “party factory”. (Now, don’t get me wrong, the places that host parties back to back do a good job too. But it does leave me a little bit breathless and over stimulated.) 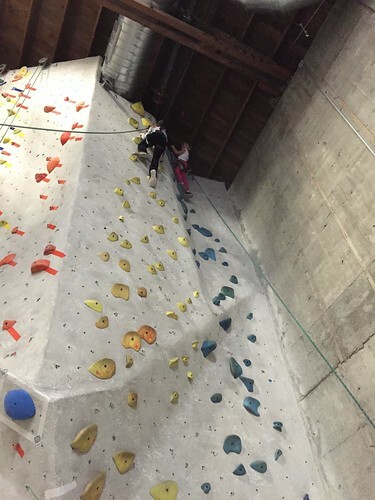 This place that we went to was a serious climbing gymand it felt like that. There were REAL climbers all around on harder sections of the walls. Next, we wore those kids out! I mean, I was tired just WATCHING them. I had NO problem feeding them cake afterwards because they had all run it off three times over. Thirdly, none of the families had ever been there before, so that was refreshing. Two kids told us they had such a good time they went back the next day together. Fourth, it was not free, but it was not as much as many of the other comparable party hosting sites. We were happy to host our friends, and lucky to have the means to do it, but it is also not a competition. 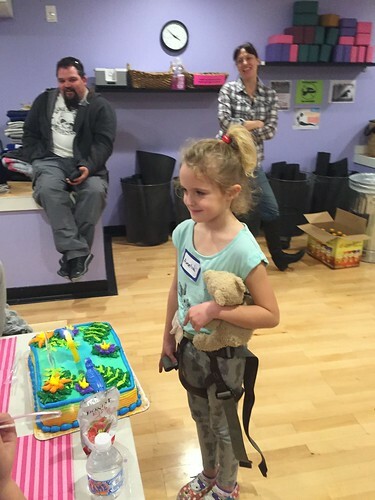 I was super happy to have found a new, safe, fun, moderate priced party option. All the way around – EXCELLENT. 3 years ago by Susi in Crafty Mom , Kids Parties , Parties | You can follow any responses to this entry through the RSS feed. You can leave a response, or trackback from your own site. What a fun idea for a party! And totally not the usual, but so cool!